“So what will you do once you reach Nilambur?” my parents asked, bemused at the thought I was going to take a train ride to a destination where I had no real reason to go to. “I don’t know.” I replied. And that was the truth. I was taking the train to Nilambur simply because it had remained a desire in the fringes of my mind for ever so long. What thereafter? was something I hadn’t pondered about. In my mid-teens when my peers were experimenting with various substances ranging from pan parag to cigarettes to marijuana, I rode buses instead. I would take a local bus to its final stop – the bus depot. And take a bus back home. That was my idea of a rush. For about ninety minutes, I sat watching life and feeling the breeze in my face, and a journey was all I needed to distance myself from reality. The train ride to Nilambur was just that. I had nothing to see or do there. I was quite happy to take the next train back…. but then destiny intervened. Or more precisely, hunger. It was noon when I reached Nilambur, and so I went seeking lunch. If the state gazette published such things, I am quite certain that they would declare ‘parotas and mutton chops’ as the official dish of Nilambur. It would be silly to try and eat anything else there. So I went with the prevailing dictate and ordered precisely that. Much as I relish eating different cuisines around the world in speciality restaurants, small town Kerala restaurants have a special place in my heart. Even the most common place dishes taste extra special. The trick is to steer clear of Chinese, Tandoori or north Indian dishes in these places as they taste most often nothing like the real thing, and opt only for Kerala cuisine. The flavours then are authentic and the taste pure heaven. Once I was replete with what seemed like fine flaky parotas and a lip smacking egg roast, the thought of taking a train back almost immediately didn’t appeal. And so I went looking for something to take back as an experience, a memory…. It was a hot afternoon and I had the beginnings of a headache. And I had been wandering all day . It was also a Friday and so just about every little restaurant in the district was closed for Friday prayers. “They are either in the gulf or working in a call centre,” the driver of the car murmured. The pounding in my head grew in intensity. Then on a quiet road as we approached Vallapuzha, I spotted a sign HOTAL. That was it. No hotel (or hotal) whatever. No claim to name or lineage. And it was open. A few ramshackle benches and tables in a shop with grimy walls and flaking plaster. A glass case held a small pile of banana fritters and masala vadas. An elderly man stepped out of an inner room. I sat on one of the benches and stared at the road and beyond. A group of road workers walked in. They stared. I stared back. I said to myself : this tea better be good after this eyeball wrestling! The staring contest ceased when the ‘hotal’ owner walked in from the kitchen and bid them to sit down. The tea arrived in glass tumblers. Hot, strong and with the just right amount of sugar. He also brought a plate of Papada vada (papadums coated in a batter of rice flour, chilli powder and a hint of asafoetida). A sip of the tea. A bite of the vada. Heavenly bliss! Everything else ceased to matter. 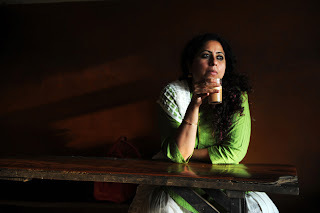 Anita Nair is the author of five works of fiction: Satyr of the Subway & Eleven Other Stories, The Better Man, Ladies Coupé, Mistress and Lessons in Forgetting; a collection of essays: Goodnight & God Bless; a collection of poems: Malabar Mind; and has edited Where the Rain is Born: Writings about Kerala. Nair has also written four books for children and two plays Nine Faces of Being and A Twist of Lime. She has also translated Thakazhi Sivasankara Pillai’s Chemmeen into English. Blissful...This is exactly what am going to do in a few days time.